I really, really wanted to title this post something like “My New Beauty Secret You MUST Know About” or “Your Anti-Aging Answer!” but given they seem a little in your face and spammy, I decided against it. But in all cross my heart and hope to die seriousness (honestly…where does that saying originate from) I have been using two products in the morning that I am in love with. As you all know, I am sent numerous beauty products every month to test. Most don’t get a mention on here because they either didn’t work or I just flat out didn’t like them. I want you to visit Mom Fabulous and know I’m sharing with you products I would and do personally use. So, here’s what I’ve added to my morning beauty routine and I could not be happier with these products: RoC RETINOL CORREXION Deep Wrinkle Daily Moisturizer with SPF 30 and RoC RETINOL CORRECTION Eye Cream. I’ve seen RoC commercials, I’ve seen the products at Target while browsing one of my favorite sections (skin care!) and I’ve known for quite some time this company existed. But, I have never ever tried anything from RoC. Why? Who the heck knows! Probably because there are so many products out there claiming to help you and it’s just down right exhausting and confusing. I had someone tell me I was glowing the other day. (No, not pregnant!) And it’s because I have gotten serious about my skin care routine and am taking care of myself from the inside out more than ever. I can honestly say I have healthier skin now than I ever have before. Okay, maybe I was born with perfect skin. but ladies, it all went down hill from there. We’re all aging right? Obviously. I just turned 40 and after the initial shock of having to write that down on paper for the first time (so, so weird), I am ready to take on the 40s! Yes, they’ll bring more wrinkles and who knows what else, but that’s OK. As long as I take care of myself and feel good. Although wrinkles are a part of life, I can do something to keep my skin looking fresh and youthful: using products that work. The RoC RETINOL CORREXION Deep Wrinkle Daily Moisturizer with SPF 30 contains an exclusive combination of pure retinol and the latest sunscreen technology. Both of these play a big role in the health of my skin. The moisturizer is clinically shown to visibly diminish deep wrinkles after 8 weeks of use and after 12 weeks’ use, even deep wrinkles are visibly diminished. My skin feels so soft and this is now my go-to moisturizer. 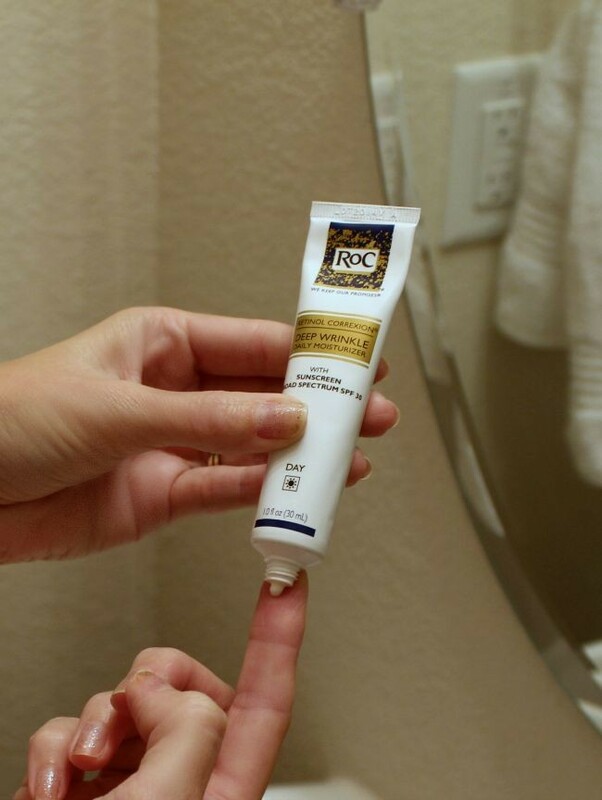 The RoC RETINOL CORRECTION Eye Cream I actually use day and night. It also contains an exclusive combination of pure retinol, plus an essential mineral complex that is clinically proven to visibly reduce the signs of aging in the eye area. This is one of those products you start to see immediate results with. Which I like, because I’m impatient as all get out. You’ll notice the skin around your eyes looking healthier and younger. It helps with crow’s feet, dark circles, and puffiness – all those fun things we deal with around the eye area. 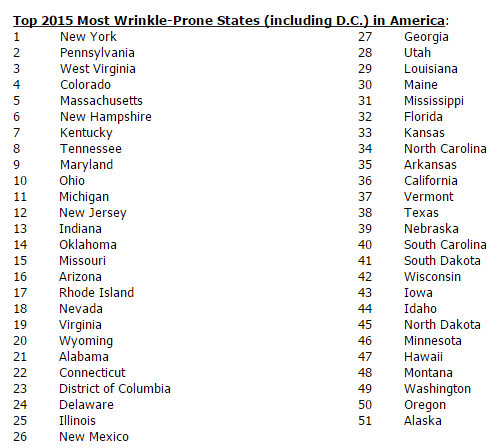 Speaking of wrinkles…. 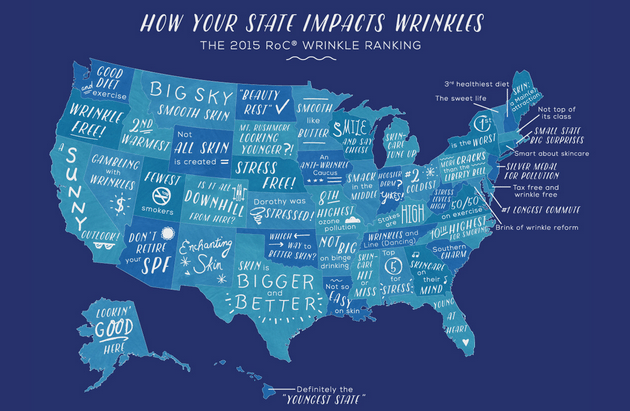 RoC® Skincare and Sperling’s Best Places just released the results of the second annual Wrinkle Ranking study, which lists the most wrinkle-prone states in America. My state of Texas is ranked #38 on the list. Not bad, not bad at all. Let’s see about the other states I’ve lived in: Alaska is ranked last at #51, Georgia is ranked #27, New Mexico is ranked #26 and California is ranked #36. Where does your state rank? You can find out more about this study here. These RoC products and more can be found at your local Target. Now tell me, what’s your morning skin care routine? I’ve been reading a lot about this product on different blogs. Looks pretty great! I shower in the morning, use a little lotion on my face and then makeup! GREAT. I’m in PA. Guess I need this! lol. Thanks for the tip!